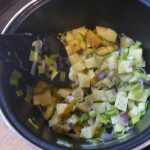 Tha mi uabhasach measail air adag smocte agus fortanach gu leòr gum bi Lachaidh, fear-èisg à Bucaidh, a’ tighinn gach seachdain thugainn agus adag aige am pailteas – fileadan ùra is smocte, Finnan haddies agus fiù ’s Arbroath smokies. Ged is toil leam gu mòr adag air a praidhigeadh air dòigh thraidiseanta, le bainne air a chur ris a’ phana aig an deireadh, tha reasabaidhean blàsta eile ann. Tha aon dhiubh, Cullen Skink, gu math ainmeil, agus tha e ri fhaicinn ann an taighean-bìdh spaideil san latha an-diugh, le gritheidean cian-annasach, ach bho thùs ‘s e brot simplidh sàthach beathachail a bh’ ann. Agus sin mar a tha an reasabaidh agamsa – an tionndadh as fheàrr leam às dèidh dhomh iomadh reasabaidh fheuchainn. Dhòmhsa ‘s e blàs na h-adaig an rud as cudromaiche – chan eil feum aice air cus ghritheidean eile a bhiodh ro laidir. ‘S e Finnan haddies a chleachdadh iad am bailtean iasgaich Linne Mhoireibh, agus ‘s e sin as fheàrr leam fhìn, ma bhios iad rim faotainn – agus ma bhios ùine agam na cnàmhan a thoirt asta. Nì iad an sùgh as fheàrr. Air neo, faodaidh tu fileadan adaig smocte le craiceann a chleachdadh, agus mura h-eil blas a’ bhrota làidir gu leòr, cuir beagan sùigh-èisg às a’ bhùth ris. Agus mar as trice cha rùisg mi am buntàta, ach faodaidh tu ma thogras tu. 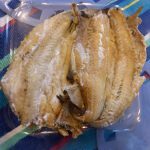 2 Finnan haddies (mu 600gr) NO fileadan adaig smocte mu 500 gr. Cuir an adag ann am praidheapan mòr le 400 gr. uisge fuar air an stòbha air teas meadhanach. Leig leis goil agus bruich an adag air a socair mionaid no dhà eile. Fhad ‘s a bhios an t-iasg a’ bruich, geàrr an t-uinnean agus a’ phàirt uaine de na leigeasan gu mìn, agus geàrr a’ phàirt gheal ann an sliseagan tana. Nuair a bhios an adag deiseil, thoir am praidheapan dhen teas. Thoir a-mach às an uisge i agus cuir gu aon taobh i. Cùm an t-uisge mar sùgh-èisg. Cuir pana mòr eile air an teas leis an ìm. Bruich na leigeasan agus an t-uinnean air an socair anns an ìm ach am fàs iad bog ach fhathast soilleir, mu dheich mionaidean. Anns an eadar-ama geàrr am bùntata ann an ciùban beaga . Cuir am bùntata agus am piobar dubh dhan phana agus cuir mun cuairt iad am measg nan leigeasan fad mionaid no dhà, an uairsin cuir riutha an t-uisge san do bhruich an t-iasg tro chriathar mhìn. Lùghdaich an teas agus leig leis a’ bhuntàta bruich gus am bi e bog. Anns an eadar-ama thoir an craiceann agus na cnàmhan às na h-adagan agus cuir iad air ais sa phraidheapan fhalamh. Bris an t-iasg ann an bleideagan gu faiceallach, an aire nach bi cnàmhan beaga air am fàgail ann. Nuair a bhios am buntàta bog, thoir am pana dhen teas agus cuir am praidheapan a-rithist air leis na cnàmhan, an craiceann agus 200gr. uisge gus an goil e, agus mar sin bidh beagan sùigh-èisg a bharrachd agad. Cuir ris a’ bhrot e, tron chriathar mhìn. Thoir an dàrna leth den ghlasraich às a‘ phana agus cuir e gu aon taobh Cuir an dàrna leth de na bleideagan-adaig agus am bainne dhan phana, agus pronn e gu mìn le inneal-measgachaidh no plocan-buntàta. Teasaich am brot a-rithist agus cuir e ann am bobhlaichean le spàin mhòr den ghlasraich agus de na bleideagan-adaig nach deach am pronnadh. Sgeadaich le peirsill no creamh-gàrraidh e. Ith e le aran cruasbach no aran-coirce agus ìm. 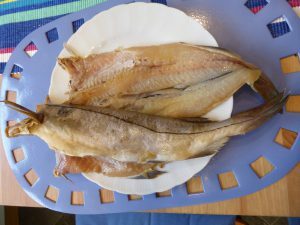 I’m extremely fond of smoked haddock and lucky enough to have Lachie the fishman from Buckie coming round every week with a wealth of haddock – fresh and smoked fillets, Finnan haddies, and even Arbroath smokies. 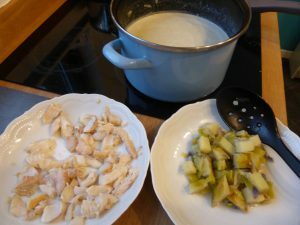 Though I do love smoked haddock fried in the traditional way with milk added to the pan at the end, there are lots of other tasty recipes. 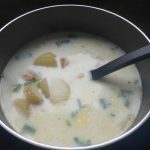 One of them, Cullen Skink, is now pretty famous, and you see it in posh restaurants nowadays with exotic ingredients, but originally it was just a simple, filling, nutritious soup. And that’s what my recipe is – the version I prefer after trying lots of different ones. For me the taste of the haddock is the most important thing – it doesn’t need too many other ingredients which would overpower that. 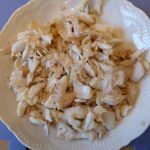 It was Finnan haddies that they used traditionally in the Moray Firth fishing villages, and that’s what I also prefer if available, and as long as I have enough time to remove the bones. They make the best stock. 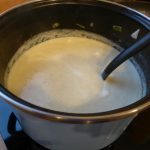 If not, you can use smoked haddock fillets, preferably on the skin, and if the taste isn’t strong enough, you can add a little shop-bought fish stock. And I don’t usually peel the taties, though of course you can if you want to. 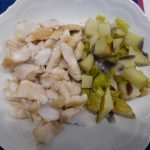 2 Finnan haddies (c. 600 gr.) OR smoked haddock fillets, c. 500 gr. Put the haddock in a big frying pan with 400 g. cold water on a medium heat. Let it come to the boil and simmer it for a further couple of minutes. While the fish is cooking, chop the onion and the green part of the leeks finely, and slice the white part thinly. When the fish is cooked, remove the frying pan from the heat. Take the haddock out of the water and put to one side. Keep the water as stock. Put another large pan on the heat with the butter. 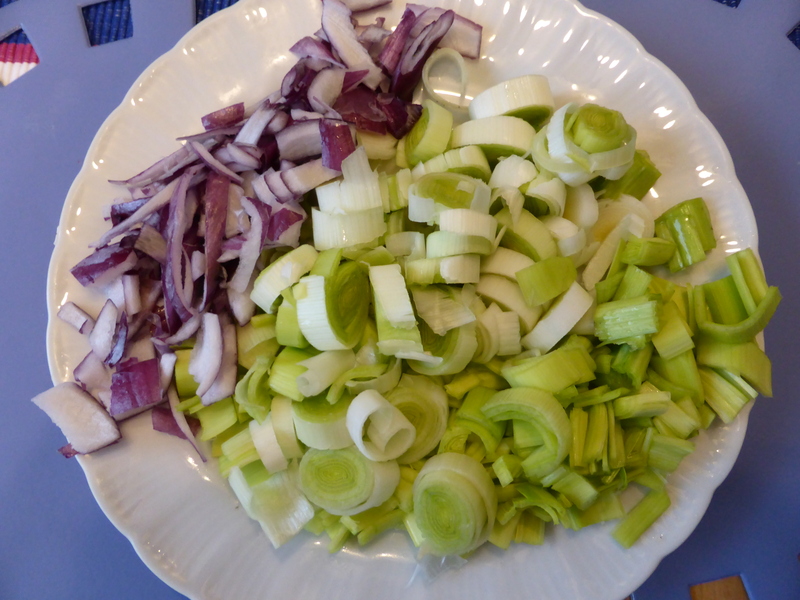 Cook the leeks and the onions gently in the butter till they are soft but don’t let them brown, for about 10 minutes. Meanwhile cut the taties into small cubes. Add the taties and black pepper to the pan and stir them in with the vegetables for a couple of minutes, then add the water in which you cooked the fish, through a fine sieve. Reduce the heat and simmer until the taties are soft. 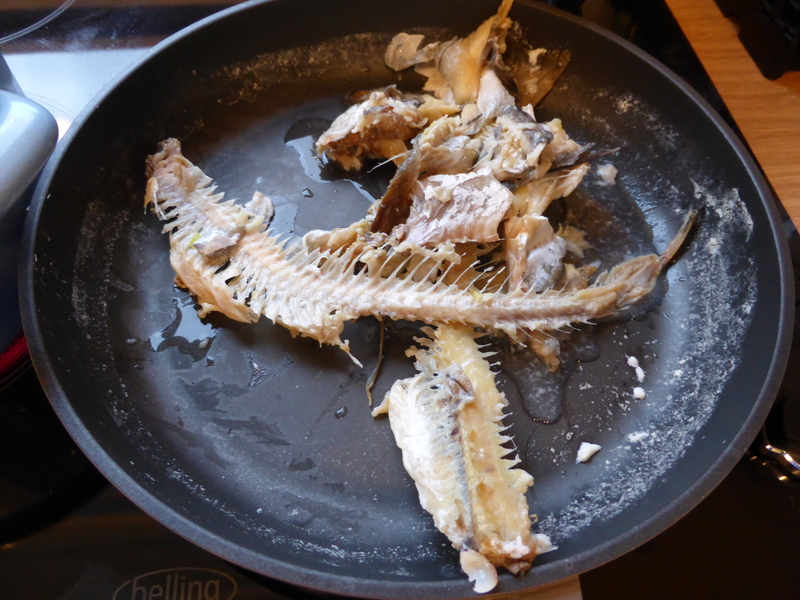 Meanwhile remove the skin and the bones from the Finnan haddies and put these back in the empty frying-pan for now. Carefully break the haddies into flakes, making sure no small bones are left in them. When the taties are soft, take the pan off the heat and put back the frying-pan with the fish bones and skin and 200 gr. cold water. 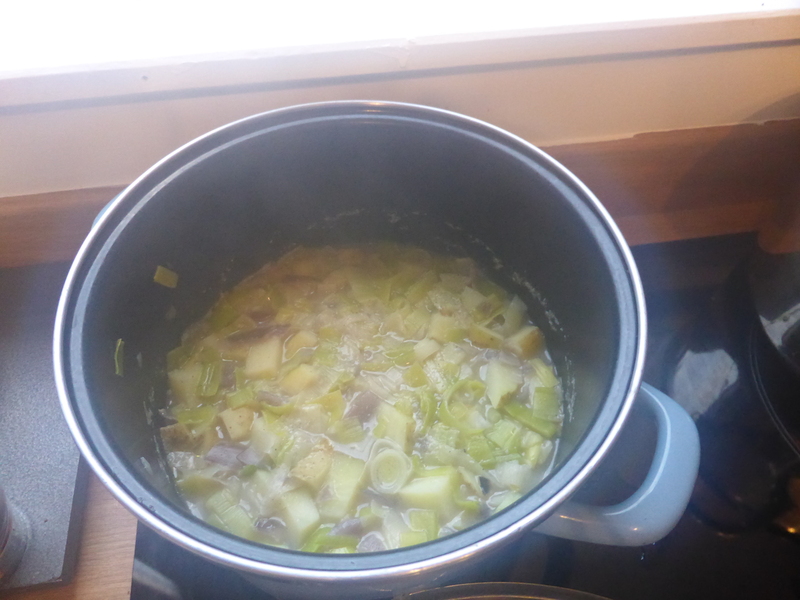 Boil them up to make a little more stock, and add this too to the soup, again through a fine sieve. Remove about half of the vegetables from the soup with a slotted spoon and set aside. 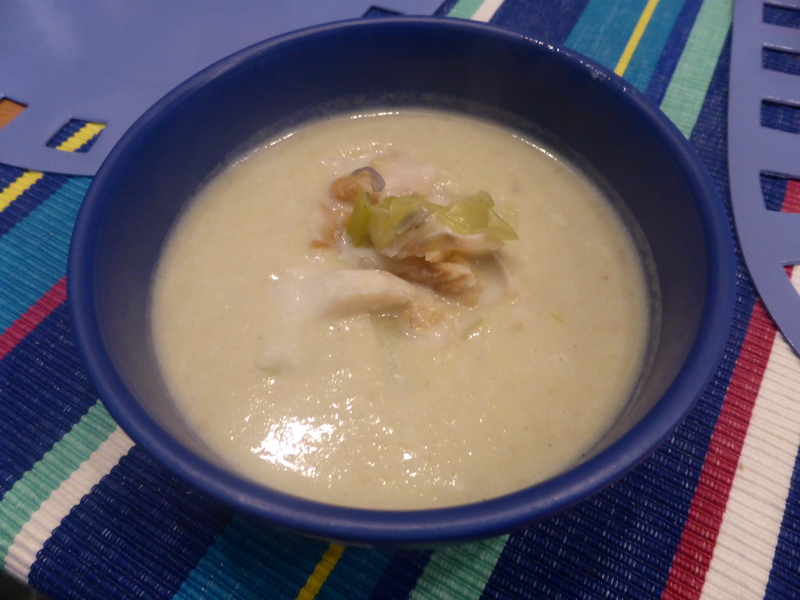 Put half the haddock flakes into the pan with the soup and puree it all finely with a blender or tatie masher. Reheat the soup and serve in bowls with a large spoonful of the reserved haddock flakes and vegetables, garnished with parsley or chives if wished. Eat with crusty bread or oatcakes and butter.